Teens can conduct cool science experiments at home using a few household items and a pH testing kit. Teens enjoy experimenting with chromatography, the effects of acid rain and light scattering to recreate the sky in a glass. These simple experiments demonstrate some complex physics and plant biology, which teens will want to learn more about after they conduct these cool science experiments. Green leaves contain all the colors that they exhibit in the autumn when the leaves usually change from green to yellow, red or orange. Colors other than green are not visible during the spring and summer, because the leaves are producing chlorophyll that is green. Separate the colors using chromatography. Collect leaves from four types of deciduous trees. Deciduous trees are those trees whose leaves change color in autumn before they shed the leaves. Oak, maple, poplar, ash and birch are examples of deciduous trees in North America. Collect four baby food jars and label the jars according to the type of tree where the leaf was collected. Cut each leaf into tiny bits and place in the bottom of their respective jars. Pour enough rubbing alcohol in each jar to cover the leaf bits. Cover the jars loosely with plastic wrap and place in a tray filled with hot water. Leave the jars in the hot water for about 30 minutes. Twirl each jar every few minutes to stir the contents. Cut four long strips from a coffee filter. Uncover the jars, insert one end of the coffee filter strips in each jar and bend the strip over the rim of the jar. The colors in the leaf will travel up the paper at different rates as the alcohol evaporates. Acid rain inhibits plant growth because it strips nutrients from the soil and poisons plants. To observe the effect of acid rain on plant growth, prepare an acidic water solution and a neutral water solution. The pH of acid rain is four. Add one teaspoon of vinegar to two cups of distilled water to produce water with a pH matching that of acid rain. 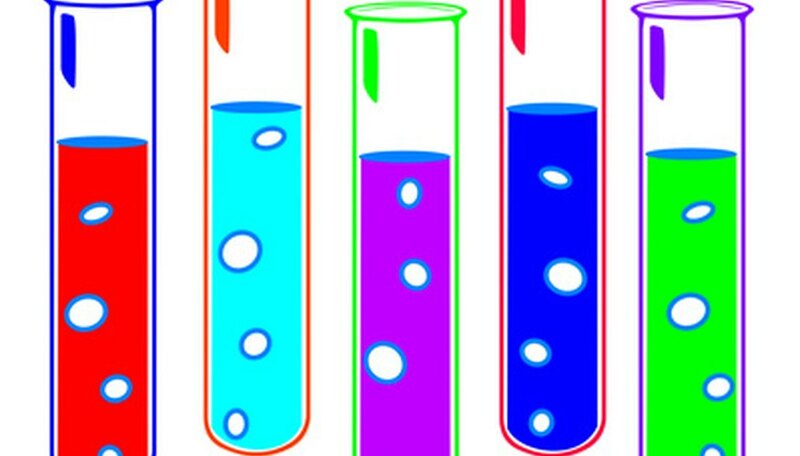 Test the water with a pH testing kit and add more water or vinegar to achieve the desired pH. Fill one glass jar about half full with the acid water and one jar about half full with the neutral water. Place one philodendron cutting in the acid and a second cutting in the neutral water. Place the jars where they will receive sunlight. After a few days, check the root growth on the cut stems. Which cutting shows root growth? To demonstrate why the sky is blue and sunsets are sometimes orange or red, fill a glass about two-thirds with tap water. Add one teaspoon of milk to the water and stir well. Take the glass into a dark room with a flashlight. Shine the light down on the glass so that the light enters the water and milk mixture from above. The light in the water should have a bluish tint. Next, shine the light through the side of the glass. Look at the water toward the light. It should appear slightly red. Finally, put the light underneath the glass and look down into the glass from the top. The water should be deeper red. The small particles of milk in the water behave much like dust particles in the atmosphere. The particles scatter the light waves. Science Made Simple: Why is the Sky Blue? Reichert, Robin. "Cool Science Experiments for Teens." Sciencing, https://sciencing.com/cool-science-experiments-teens-6597696.html. 25 April 2017.